May Software Club - Premier+2 Software Class: Encore! Encore! Come along as we dive deeper into Encore! Since its inception, Encore has allowed us to more easily use multiple repeats of a design without having to meticulously line everything up, either by using copy, paste or duplicate. Designs appear in perfect alignment almost magically and can be adjusted with minimal effort. 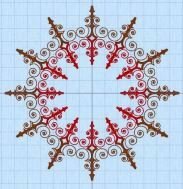 In this class, we will make a clock face, a seasonal border and more! Requires Premier +2 Embroidery and up.